Parents are you getting ready to take your teen to All Star Driver Education or AK Services to get their learners permit? Is your teen ready to get behind the wheel on their own? We found this great article on Edmunds.com, “10 Things Teens Should Know About Cars and Driving” and we wanted to share it with you and your teen driver. When a teenager gets a driver license, it signifies freedom and the lure of the open road. But with this newfound freedom comes a host of new situations and possible problems that most teen drivers have never encountered before. It's a good idea to review these scenarios with new drivers in your family, and discuss how to handle them before they happen for real. From traffic stops to road rage, here's a primer on what you need to tell teen drivers as they take to the roads. Putting your teen behind the wheel can be both a proud and scary feeling for any parent. Help them be road ready with helpful advice and practice. Safely pull to the side of the road, turn off your car, roll down the window and keep your hands visible. Don't make any sudden moves or argue with the officer. Do your arguing in traffic court. Pull completely off the road, even if it means destroying the tire. Call roadside assistance and let that person change the tire. If you have a spare (many cars now only have an inflation kit) and know how to change the tire, make sure you are out of traffic and in plain sight of oncoming traffic before changing it yourself. If there is any change in the car's performance, any mechanical noises, smoke from the tailpipe or electrical smells, stop the car and call for assistance. If there are none of these symptoms, take the car to a dealer and let them diagnose the problem. However, if you just bought gas, the light might just be indicating that the gas cap is loose. Tighten the cap and continue driving. The light should go off on its own. Take your teen out for lots of practice, provide them with advice, they'll listen. Don't get in the car. Do anything not to drive with an intoxicated person, and that includes calling your parents for a lift or paying for a taxi. Your next move is to try to prevent your drunken friend from hurting themselves or someone else. Most states ban all cell phone use by novice drivers, so be sure you know if these provisions apply where you live. If it's permissible to use a cell, always use a hands-free device so you can keep your hands on the wheel and your eyes on the road. Learn how to pair your phone with the car's Bluetoothsystem. Don't even think about texting while driving (no, not even at stoplights). Search Edmunds.com's Car Maintenance Guide or the Web to get an estimate for how much the repair should cost. Search online for garages with high customer ratings and ask friends for recommended garages. Call the garage and ask for a ballpark estimate and let the garage know you are contacting other places for their best quote. Use your intuition to make the final decision on whom to trust. Don't just wander onto a dealership's car lot. Instead, contact the Internet department of several dealerships to get multiple quotes and compare these with Edmunds.com's True Market Value® price for any car you're interested in. Make sure you check incentives and rebates. Follow up with phone calls to the Internet managers of these dealerships to verify the terms of their offers. Finally, ask the dealership to deliver the car to your home or office to avoid the hard sell in the finance and insurance office. If the car is drivable and there are no serious injuries, turn on your flashers and pull safely out of traffic. Call the police to report the accident. Exchange insurance information with the other driver but refrain from discussing the accident and who is at fault. Make notes and use your cell phone's camera to take pictures of the cars involved. Slow down when driving in the rain or snow and leave more distance between other drivers. Reduce your speed and leave more room between your vehicle and those in front of you. Understand how to handle skids. If possible, practice reacting to skidding in safe conditions, such as a snow-covered empty parking lot. Understand that a car might hydroplane on a rain puddle on the road and learn how to react to driving with reduced traction and visibility. Understand the severe consequences to you, your car and your driving record when minor disagreements escalate to life-threatening situations. When someone offends you, take a deep breath and know that your anger will dissolve in minutes. Don't anger other drivers by cutting them off or tailgating. If you've inadvertently angered another driver, don't get drawn into interacting with them. Ignore them or, if necessary, change your route. Finally, repeat this phrase: It's just not worth it. Be sure to share this information with your young driver and for even more driving tips visit Edmunds.com and our Driving Tips articles. This is a great article. Since winter months are soon approaching, I have been trying to educate my daughter on driving safety in bad weather. I think the best advice to give to any teen driver is watching your speed, do not brake hard, and staying away from using cruise control. Another important thing is to make sure you tires are in good condition. This can help with situations when there is black ice. 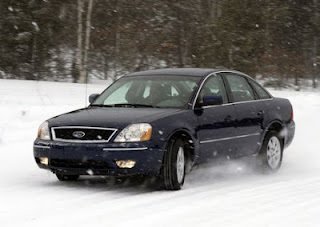 It also is important if your car is not four wheel drive. I just put new Nokian Tyre tires on her care because they are safe and reliable.